The HP Pavilion x360 11-n012dx is another 2-in-1 laptop / tablet PC equipped with the processing muscle of Intel Pentium N3530 quad core SoC that features a base clock speed of 2.16 GHz with Turbo Boost technology to increase the device performance. Because of 4 CPU cores and a clock speed of up to 2.6 GHz, the Pentium N3530 SoC is significantly faster than previous Intel Atom processor like the Atom N2800. 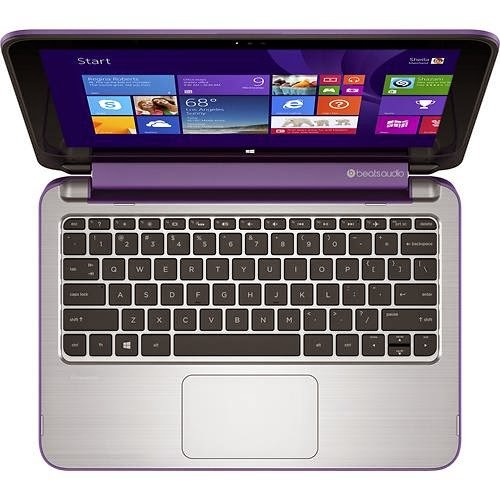 It is also packed with integrated GPU called Intel HD graphics that features up to 1792MB total video memory. As regards to display, this HP Pavilion x360 11-n012dx 2-in-1 laptop is packed with 11.6 inch WLED - backlit high - definition touch - screen display with 1366 x 768 screen resolution. In comparison to high end laptops the display of this device is inferior which can be blamed for its low resolution. 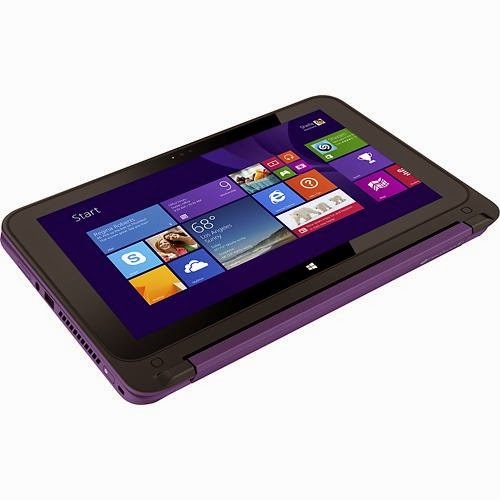 Other specifications of this HP Pavilion x360 11-n012dx 2-in-1 device includes 4 GB DDR3L SDRAM memory; 500GB hard drive that spins at the rate of 5400 rpm and includes 25 GB of lifetime Cloud storage from Box; front - facing HP TrueVision high - definition webcam with integrated dual - array digital microphone and an ambient light sensor; multiformat media reader that supports SD format; and HP finish in horizontal brushline neon purple for stylish look. 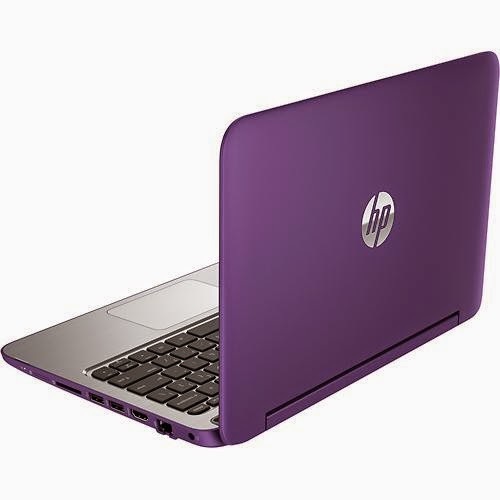 In terms of connectivity options, this HP Pavilion x360 11-n012dx laptop PC is equipped with 1 USB 3.0 port and 2 USB 2.0 ports, Bluetooth interface, high - speed 1 x 1 wireless LAN (802.11b/g/n), 10/100Base-T Ethernet LAN, and HDMI output port. 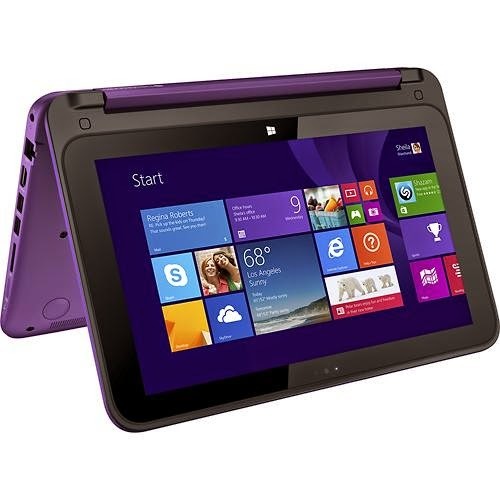 This 2-in-1 laptop features 360° hinge that allows to use as laptop, stand, tent and tablet modes. 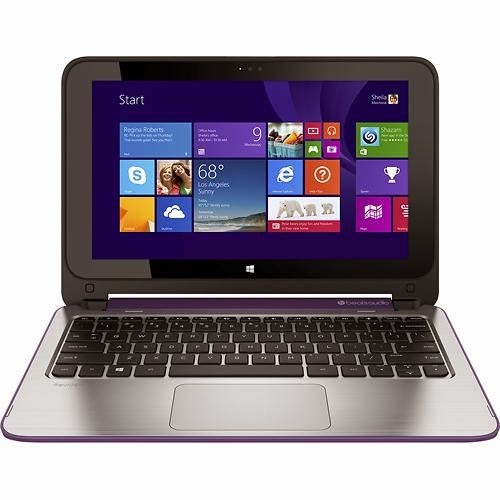 The HP Pavilion x360 11-n012dx 2-in-1 laptop runs with Microsoft Windows 8.1 64-bit operating system. It measures about 12.1 inches x 8.5 inches x 0.9 inches and weighs about 3.1 pounds. You can have this laptop for just $ 399.99. Another 2-in-1 laptop / tablet PC is the Acer Aspire R3-471T-54T1.